Johnsonville land sale, 1912. S.B. 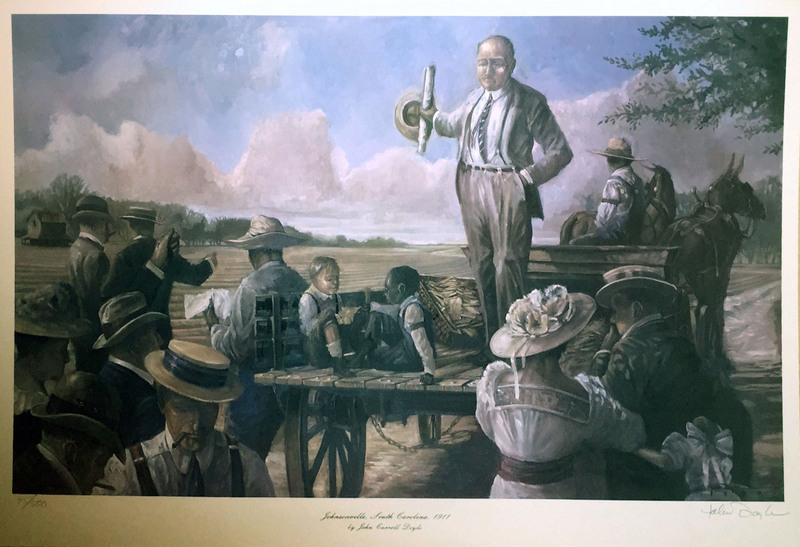 Poston is depicted auctioning lots in Johnsonville. S.B. 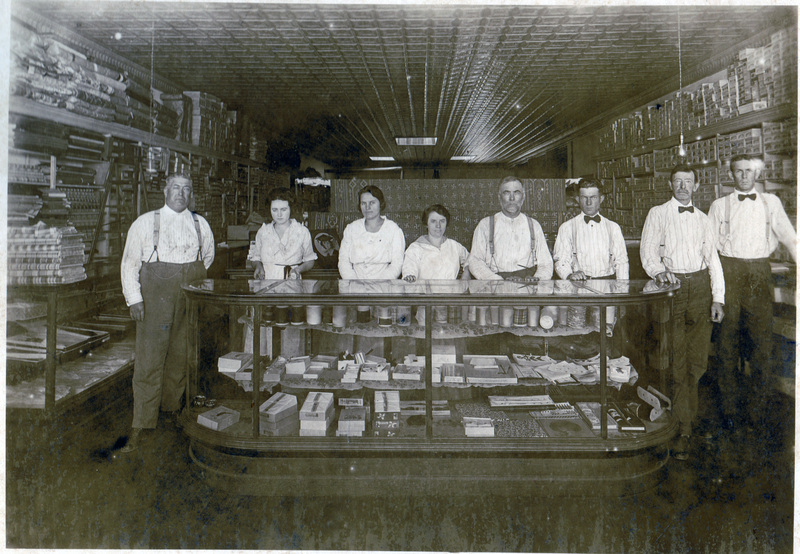 Poston (left) stands with other workers in a store, most likely in the "Poston Block" at the NW corner of Broadway St. and Railroad Ave.
County Record, Sept 1912 discussing the land sale to form Johnsonville's business district. Before bridges and railroads were commonplace in the Pee Dee, many roads led to a ferry. One strategic ferry in the northeastern area of Williamsburg County was Witherspoon’s Ferry. Late in the summer of 1780, Maj. Gen. Horatio Gates led a Continental army toward South Carolina to attempt to roll back the British conquest of the province. As Gates prepared to meet the British at Camden, he sent Col. Francis Marion - a Continental officer who had only escaped the fall of Charleston because of a broken ankle - south towards the Santee River to gather the local militia forces and prevent a British retreat. On April 3, 1781, after the raid on Snow’s Island, Lt. Col. Welbore Ellis Doyle retraced his steps six or seven miles to Witherspoon's Ferry, where he camped on the north bank of Lynches Creek (now known as Lynches River). Around the same time, Brigadier General Francis Marion camped at Indiantown, at which time his force had quickly evaporated to about seventy men thanks to the height of planting season. Even so, on April 3rd, Brigadier General Francis Marion ordered Lt. Col. Hugh Horry to take his mounted infantry and travel to find Lt. Col. Doyle. At Witherspoon's Plantation (not the same location as the Ferry), Lt. Col. Doyle had some foragers there collecting food for his troops. When Lt. Col. Horry arrived at the plantation, they engaged the Provincials, killing nine men and capturing sixteen. Some call this a separate engagement known as "British Foragers Attacked. "The Patriots quickly pursued the fleeing Provincials to Witherspoon's Ferry. There, they caught the British rear guard scuttling the ferryboat. The Patriots fired on the Provincials. Lt. Col. Doyle quickly formed his men along the bank of Lynches Creek and delivered a volley of musketfire on the Patriots. After this firing, the Provincials gathered up their belongings and headed towards the Pee Dee River. Doyle is said to have lost nine killed or wounded, and 15 or 16 taken prisoner in the encounter. Either just before or after this event, Brigadier General Marion was joined by a reinforcement under Col. Abel Kolb to assist against Lt. Col. Doyle. Lt. Col. Doyle, however, made haste to withdraw, destroyed his heavy baggage, and retired to the safety of Camden. Col. Doyle, an active, enterprising officer, had driven Col. Ervin, who commanded only weak guard, from Snow's island. But before retreating he had Marion's arms, stores and ammunition thrown into Lynch's creek. This, at the crisis, was a most serious loss. From Sampit, Gen. Marion marched back towards Snow's island; on the way he received intelligence that Doyle lay at Witherspoon's ferry, and he proceeded forthwith to attack him. Doyle had taken a position on the north side of the ferry, and when M`Cottry, in advance, with his mounted riflemen, arrived at the creek, the British were scuttling a ferry boat on the opposite side. He took a position behind trees, and gave them a well directed and deadly fire; they ran to their arms and returned a prodigious volley, which did no more harm than that of knocking off the limbs of trees among the riflemen. Doyle had received news, which occasioned him to retreat for Camden. The ferry boat being now scuttled and sunk on the opposite side, and Lynch's creek being swollen, and at this place wide and deep, Gen. Marion proceeded up the creek, and swam over it at the first place he reached, five miles above Witherspoon's. This was the shortest route to come at Doyle. He pursued all that day, and the next morning till nine or ten o'clock, when he came to a house where Doyle had destroyed all his heavy baggage, and had proceeded on with great celerity towards Camden. 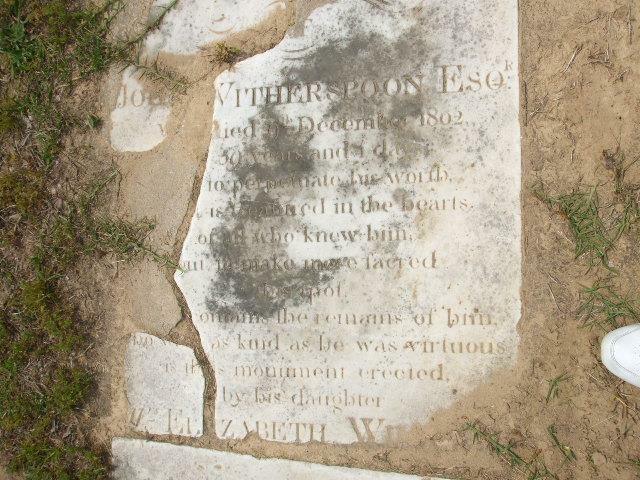 When Williamsburg County land owner Robert Witherspoon (1745-1787) died with no issue, his elder brother John Witherspoon (1742-1802) took control of the property. Witherspoon's Ferry had already been in use during the Revolution, and this spot served as the backdrop for General Francis Marion's commission to lead the militia. In 1801 it was ordered that a Ferry should be established and vested in John's care. John married Mary Conn and had one child, Elizabeth, who later married David Rogerson Williams, Governor of South Carolina from 1814-1816. After leaving the governorship in 1816, John's son-in-law David R. Williams had returned to Darlington County to resume his planting and manufacturing operations. In 1819, Williams protested John's previous will on behalf of his wife Elizabeth and obtained the Ferry lands. Williams was elected to the South Carolina Senate 1824-1827, after which he died accidentally while supervising the construction of a bridge over Lynches Creek on November 17, 1830. Aimwell Presbyterian Church was still holding services as late as 1823 as noted in the journals of William Bartell, but later ceased operations and merged with Hopewell Presbyterian Church further up River Road. William James Johnson, born 1787, had purchased a portion of the plantation from the Witherspoon estate in 1825. 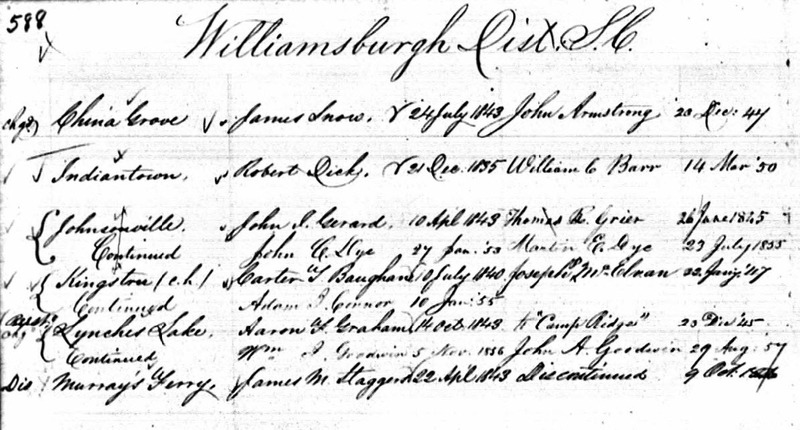 The 1850 census of Williamsburg County shows William Johnson, a man of considerable wealth for his time and place, living just below where the American Legion home (The Hut) stands in Johnsonville (as of 2016). Enumerated in the household in 1850 are his wife, the former Sarah Crosby; son James H., age 23; daughter Sarah, 21; and the following lodgers: Joseph Costellen, a fishermen from Italy; John C. Dye, a merchant from North Carolina who witnessed William Johnson’s will; and Herman Zadix, a merchant from Australia. Johnson’s Ferry was the point at which the stagecoach stopped to change horses. As the stagecoach passed east over Lynches River on the ferry, a Johnson slave in charge of the ferry mules announced the number of passengers with blast from a fox horn ---one blast for each passenger, thus informing Mrs. Johnson of the number of places that should be set for dinner. The passengers ate during the change of horses, and then proceeded to Union for the next stop. 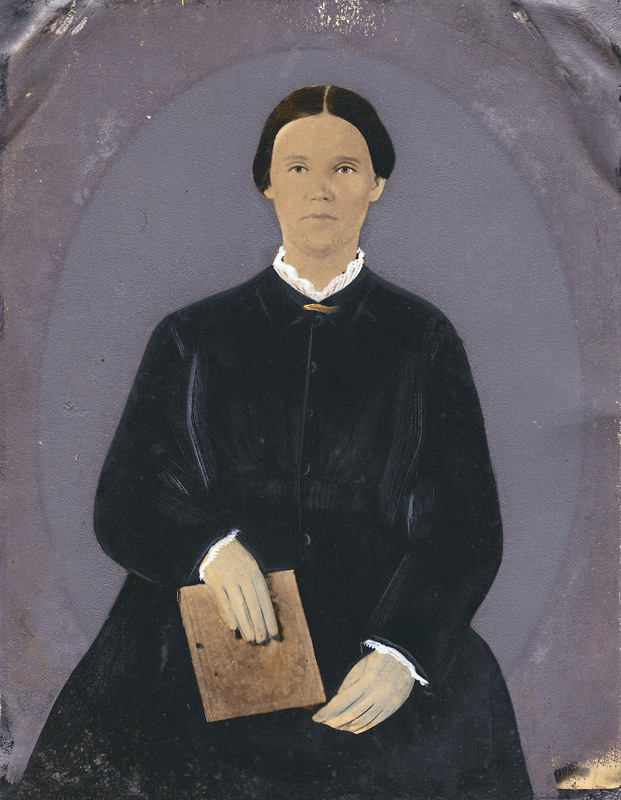 The Johnson’s closest neighbors were their daughter, Margaret, and son-in-law, Thomas Rothmahler Grier, as well as Henry Eaddy, a large landowner who also operated a cotton gin near the ferry. 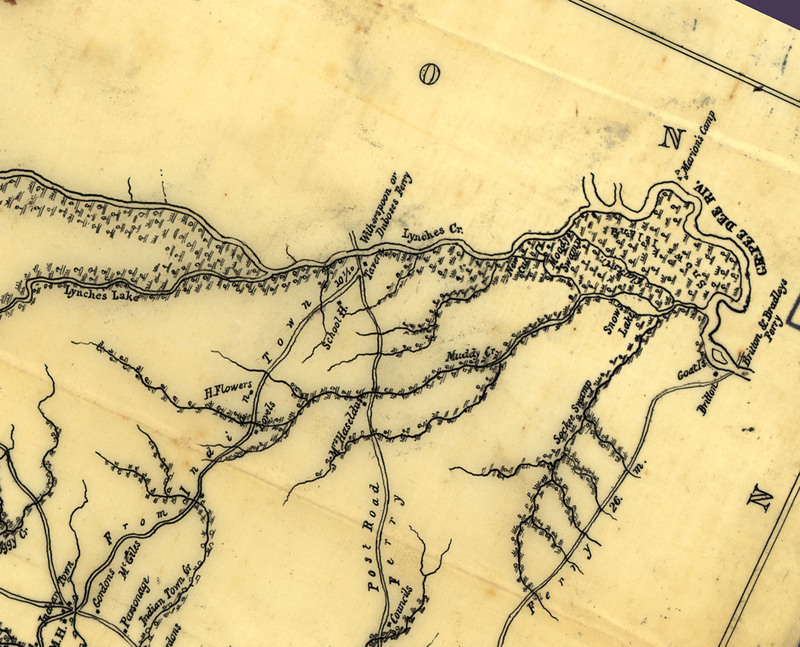 Johnsonville had received its name in about 1843, from the action of the above named Capt. Johnson who had settled at Witherspoon’s Ferry, which soon took the name of Johnson’s Ferry. (1843): “At the solicitation of Capt. William Johnson, at Witherspoon Ferry, and Hon. A. W. Dozier of Pee Dee River, Dr. McGill [I] settled at the Ferry House. For the first few months Capt. Johnson and family resided at the old ferry house situated on the bluff of Lynches Creek, but soon we all moved down to his new house situated at the junction of Indiantown and Stage Coach Road. Old Bram, the colored ferryman, did no have much to do, and kept our house supplied with trout and bream, and in the preparation of them for the table- there were frequently three dishes: fried, boiled, and stewed in cream. "The family was very kind and old Mrs. Johnson was the most motherly of women. Thomas R. Grier, who had married their eldest daughter, was living with them at this time and was bank-rupt. Their eldest son Nicholas F. Johnson lived at the Johnson’s new house, which was later owned by Mr. Grier, while their younger son, James Johnson, was the farming boy and was of great comfort to the young doctor. "About this time Henry Eaddy (1778-1855) was settling in the place where his son, Hon. H. E. Eaddy (1839-1912) lived later, and he and Capt. Johnson requested the young doctor to assist in writing a petition to the Postmaster General at Washington for an office to be established here, suggesting Johnsonville as its name, and Mr. John Gerard as its postmaster. Our petition was complied with, and Capt. Johnson, Mr. Eaddy, and Dr. McGill were securities to the bond of Mr. Gerard. The stagecoach stopped at the Johnson’s house. All the mail for the surrounding communities was left in Capt. Johnson’s care. This provided an excellent reason for him to request a post office be granted. In more than 200 years association with the Johnsonville and later Hemingway area, the Johnson family has not only given its name to a town, but land on which an early church was built and a number of doctors emerged from this family. William Johnson, Sr., father of William J. Johnson of the ferry, was born 1760 and died March 16, 1825. He married Celia, last name unknown, born 1765, died Sept. 16, 1825. They are buried on a bluff on the north side of Lynches River about three miles from Johnsonville on the Johnson plantation. This tract of land was later owned by a grandson, William J. Johnson II, who gave four acres of land from this plantation for Trinity Methodist Church. The tract is described in the deed as “situate and lying in Marion District…on the Southwest side of the great Pee Dee River one mile from Johnson’s Ferry on the Lynches Creek on the Stage Road leading from Georgetown to Cheraw.” Trinity Methodist Church was built on this site. Remodeled and modernized several times, this church still occupies its original building. The beautiful chancel furniture that graces the sanctuary was made by Brig. Gen. John Henry Woodberry, great-grandson of Henry Eaddy and son of South Carolina's (and Johnsonville's) first woman mayor, Rosa Belle (Eaddy) Woodberry Dixon. Almost moribund after the Civil War, Johnsonville was kept alive by the turpentine business, and about the only people who accumulated any property were those who worked in pine timber and related industry. The early turpentine dealers and workers migrated into Williamsburg County before the War began. Among the dealers in naval stores and pine products that made fortunes in this part of the country were J. F. Carraway, R. H. Kimball and F. Rhems and Sons. Johnsonville and the ferry were busy places for a season. Many young farmers adapted to changing times by engaged in part-time “turpentining” or cut and floated their own timber to market, riding the logs down Lynches and Pee Dee Rivers to Georgetown, walking the long distance back home. In August of 1897, the area celebrated the first bridge spanning Lynches River at the ferry site. Kingstree's County Record paper noted: "The bridge across Lynches river at Johnson's Ferry was accepted by the supervisors of Florence and Williamsburg Counties last Saturday. The People of the two counties held a joint picnic in celebration of the occasion, and a great time was had. Rev. Mr. McWhite, of Florence, addressed the crowd, which numbered about 1,000. The bridge will be a great convenience to the public of that section." By the end of the 19th century, the turpentine industry had begun to decline here, and tobacco was introduced as a money crop. The Seaboard railroad arrived in the area in 1912. At this time only about 2 dozen families lived in the surrounding area. The first streets were layed out at this time on land within a 1-mile radius of the train depot. A land sale was organized by S.B. 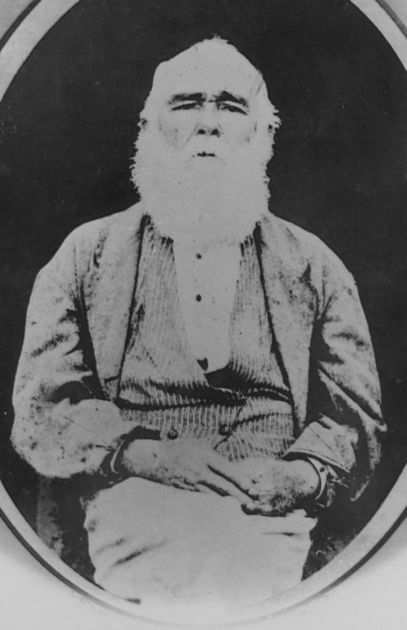 Poston, a local farmer and businessman who had operated the S.B. Poston company in the areas since about 1903. The land sale took place on September 12, 1912, offering sandy pasture lands owned by Poston. Trains ran special schedules and offered free rides for anyone attending the sale in Johnsonville. At the sale, 100 business and residential lots were offered and the free trains brought up to 5000 people to the area for the sale. At the end of the day, 77 lots were sold at an estimated total of $18,000 - over $440,000 today if adjusted for inflation. Johnsonville was incorporated as a city in 1913, with Sylvester Briley Poston serving as first mayor. It is in Williamsburg County, but it really ought to be in Georgetown, because it is worth having. Johnsonville is almost brand new; just out of the bandbox, as it were. But its newness won't hurt your eyes to look at it. In fact, one look will call for another, the situation is so attractive. One mand said the other day that Johnsonville was becoming a habit. It really seems that a right smart scattering of folks are getting the habit. In 1913, brick construction and cement sidewalks were laid. The northwest corner of Broadway and Railroad was called the Poston Block. The Times called it "as substantial a block as money can make." The corner at Railroad Avenue was occupied by the Farmers and Merchants Bank, established in 1911. Officers were J.S. McClam (president), S.B. Poston, and C.J. Rollins. The middle wareroom of the building was the general store of S.B. Poston, filled with merchandise and groceries. Next door was the Johnsonville Hardware Company where S.B. Poston served as president. Arthur Rogers was the general manager. All of the stores and banks had heavy plate glass windows and the walls of the building were 17 inches thick in antipation that a second story may be added later. Some of the prominent tobacco farmers during this time were A.E. Flowers, Dr. H.L. Baker, J.W. Cox, George W. Davis, M.V. Cox, V.E. Cannon, J.D. Haselden, R.E.L. Hughes, W.H. Marsh, J.G. Eaddy, S.O. Eaddy, and C.C. Richardson. Two tobacco warehouses were completed in 1913 and an estimated 2 million pounds of tobacco were handled in the first year. A new hotel with 15 guest rooms was completed on the south side of the railroad tracks, conducted by Mrs. Chapman, who also ran a boarding house. Doctors in that first year of incorporation were Drs. Cockfield, Prosser, and Chapman. Dr. Cockfield also owned the Cockfield Drug Company, managed by Clarence Davis. The Johnsonville School on Marion Street opened its doors in 1917. Before this, classes had been conducted in a small home donated for the purpose. 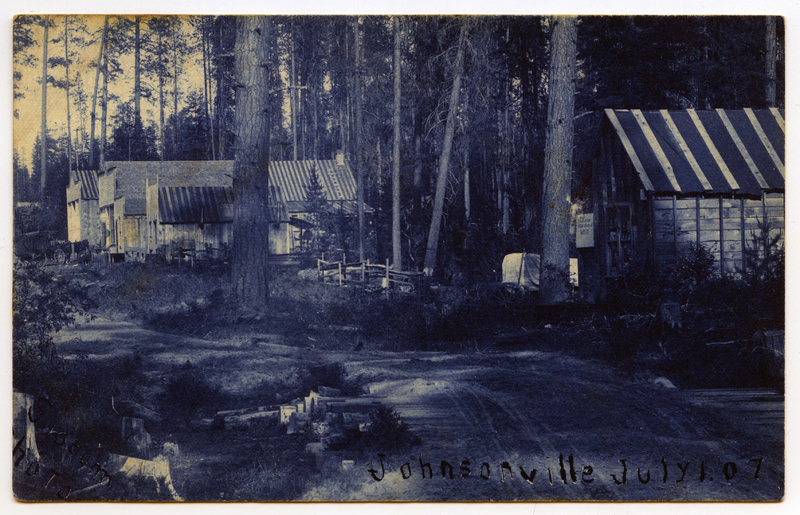 In the 1920s, Johnsonville was a bustling community with stores lining Broadway. There were 3 or 4 tobacco warehouses that held regular auctions. A savings and loan association and wholesale grocery were among the town's business establishments. 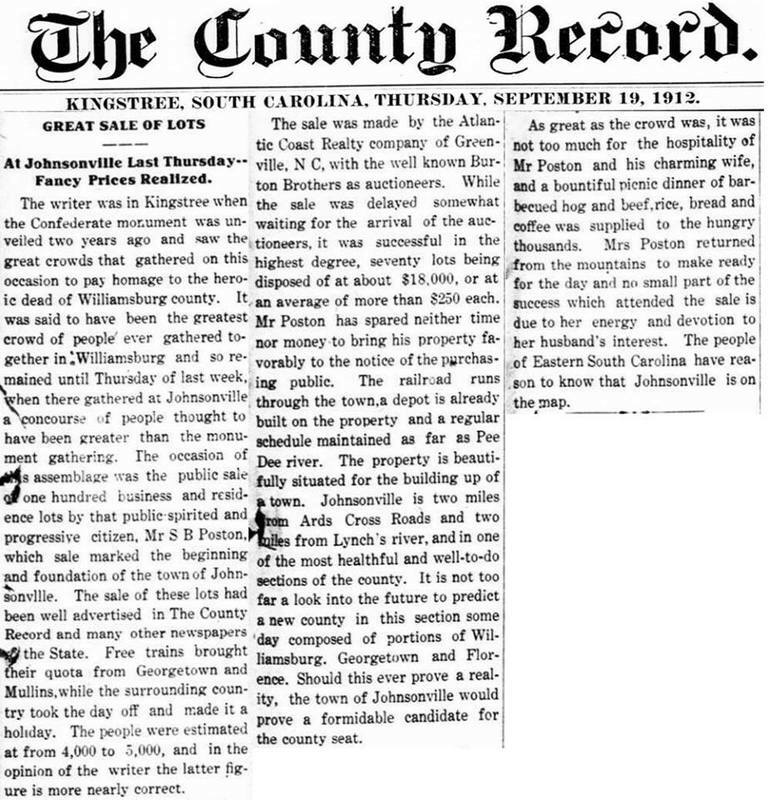 On March 4th, 1921, Johnsonville was annexed into Florence County.